decorative art | Kim - splash it! My first set of stamps was launched by Chocolate Baroque at the beginning of the month but I’ve only just got round to a bit of experimentation. As Halloween is just around the corner I thought a good one to start with would be La Maison. Before I coloured I used a Zig Millennium 005 pen to add the spider and web, bats, and spooky ghost, to the windows – oh, and the ‘Thing’ coming through the front door. I wanted the house to be almost in silhouette, but still retain the detail, and I needed the windows to show the spooky goings-on inside, so I used Warm Grey 90%. The front door and loft are Scarlet Lake. The shading in the windows goes from Canary Yellow at the bottom, though Spanish Orange to Scarlet Lake at the top. The tiny pumpkins are cut from coloured card stock with details added with the Zig pen, then stuck on with your favourite glueing medium. The shadow round the house is Purple. Finished with hand lettering, and a fine texture stamp for the edge. Matted on black card, then a pink to match the front door. This is a project I’ve wanted to try for ages. Some time ago I found an old, traditional French bread bin – huche de pain – and thought that the front panel is crying out for a little trompe l’oeil. 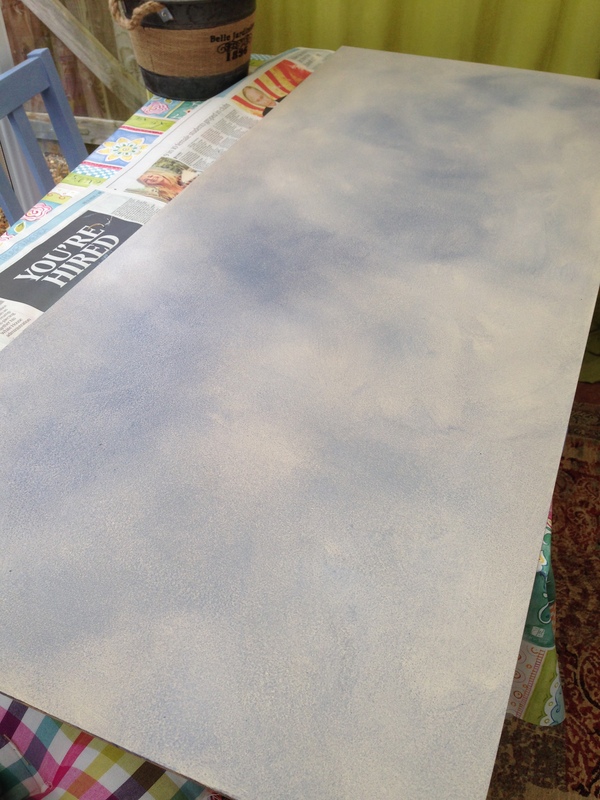 The huche is finished in DecoArt Americana Decor Chalky Finish in ‘Serenity’, discretely distressed (as opposed to thoroughly traumatised, as is the want of some upcycle-ers), and treated with clear wax. 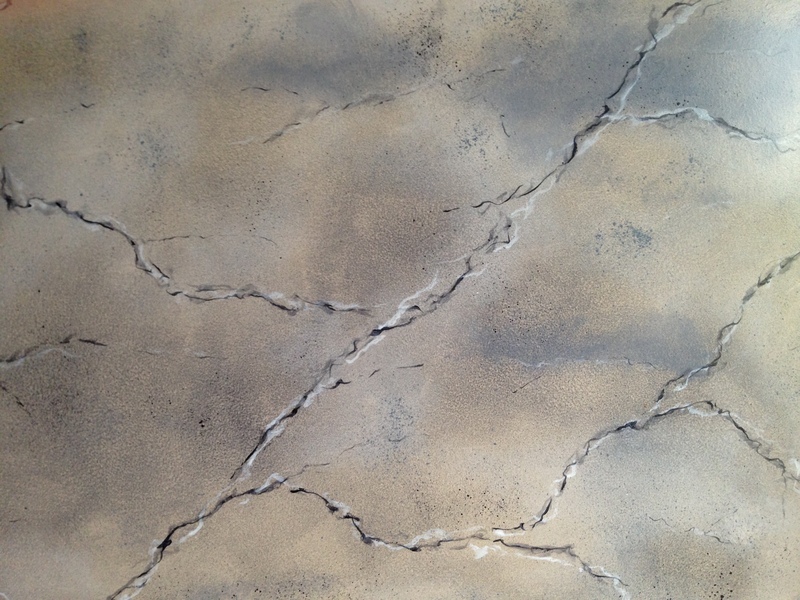 The picture is in DecoArt Americana acrylic paints, with DecoArt Media Fluid Acrylics for shadow. I’ve called this one ‘Unstrung Hero’, for obvious reasons. See the previous post for a full explanation, but basically my daughter wanted her old acoustic guitar ‘steampunked’, as nobody in the family can play it. 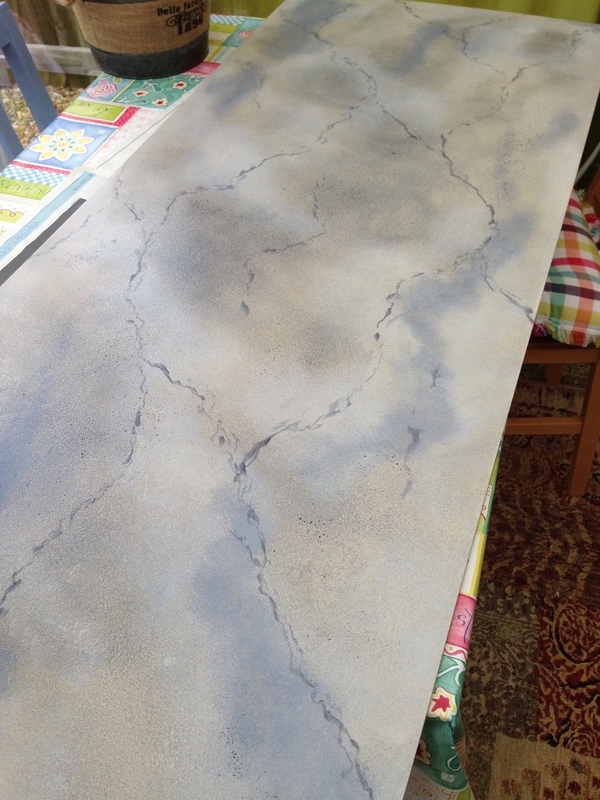 It went through many phases on its transformational journey using a range of products from DecoArt, such as Media Fluid Acrylics, Texture Sand Paste. Full details of the project will appear in The Decorative Folk Artist, newsletter for BADFA* members. Here is the finished guitar. No longer a musical instrument, I have seen to that, but a hero to have survived, and unstrung, to boot! So it begins. I have been the custodian of a rather knocked-about acoustic guitar for a few weeks, and now I’ve cleared the backlog of ‘things-I-gotta-do’, this musical monster has emerged from its lair. Well, that’s the prep work done. I’ll keep you updated as things progress. The marble headboard is finished. The colours chosen for this take on Carrara marble are shades of grey (but not fifty!). Rather than the extremes of black and white, I have used Paynes Grey for the darkest, and mixed a value 8-9 grey for the lightest. White was used for the light fault lines. 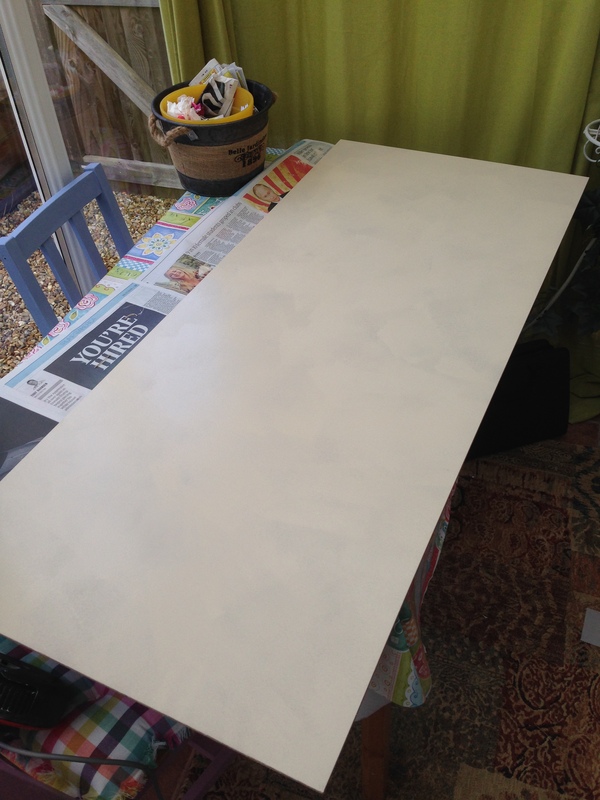 The finish was built on MDF, sealed, then base coated with a pale beige silk emulsion. The final finish is satin. What do you think? It helps to have the right tools for the job. I have a commission for a large faux finish piece, so I need the proper equipment to get it done. 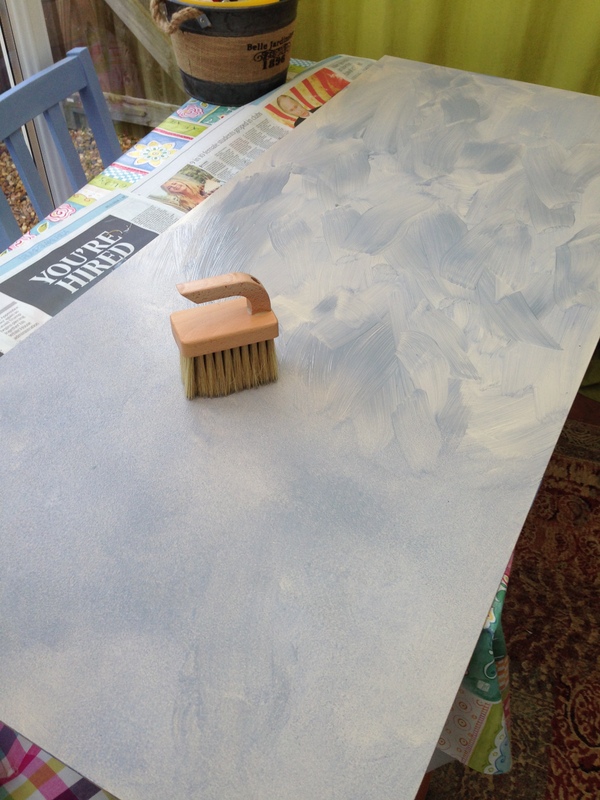 On a small decorative article I can use my ordinary artist brushes and achieve the desired results, but this one will need more time, and the correct tools. It took a while to track them down, but after checking out various suppliers, I ordered them on-line. To achieve the desired finish the paint has to remain ‘open’ – workable – for considerably longer than it would normally, so it is mixed with a glazing medium. An industrial size pot is needed, rather than the small quantities used in art work. My commission is for a large faux marbre (marble) headboard, so I need a large stippler and a badger hair softener. For faux bois (wood), I’ll need a horse-hair flogger and a spalter. They’ve all arrived, so I’m ready to paint! I can’t believe that this time last week I was on my way to Crick for the BADFA Convention! Tempus darned well fugit-ed! What a great weekend it was, too! 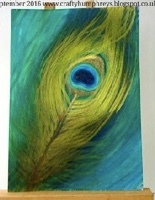 I spent Friday in Suz Humphrey‘s class, painting a rather nifty peacock feather in the morning, and learning some equally nifty techniques with her FolkIt session after lunch – a super day, thanks Suz! After painting all day Friday with Peggy Harris, those brave enough came to my Friday Fun session. 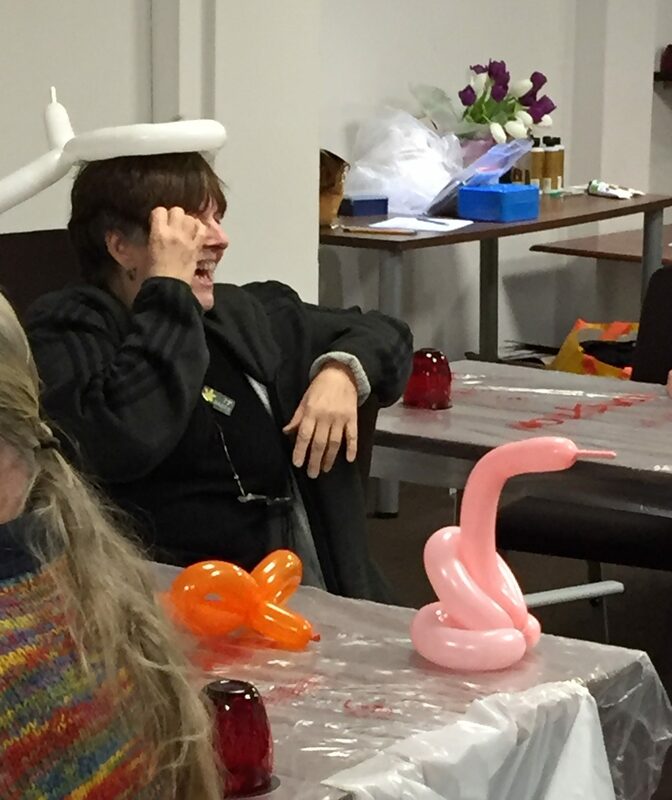 After rounding them in to teams we had a quick quiz – the theme was famous women, with some obscure questions I’d found – followed by an hour of making some kind of animals with modelling balloons. I’m not sure where their minds were going, but some of the articles produced were not of any animal I’ve ever seen. Saturday, it was my turn to teach. 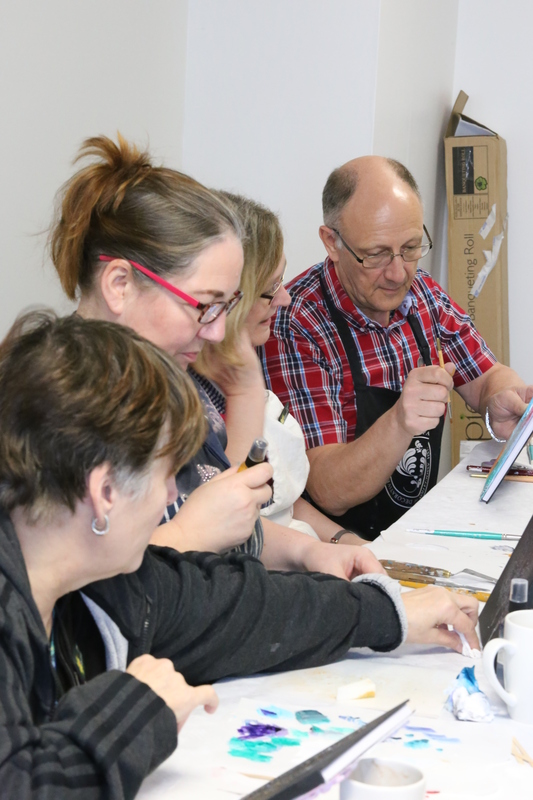 I lead a gentle introduction to mixed media where everyone was encouraged to experiment with texture and colour, and to try media that they hadn’t used before. All seemed to go as planned. Julie and I got to grips with Powertex on Saturday evening. We’d heard about it but this was our first ‘hands-on’ with it. We’ll be getting mucky again soon, when Claire and Debra run another class in the studio in Crawley. Sunday was wind-down day for me. Peggy taught her last class, and convention shut down for another year. Everyone packed up and went home. 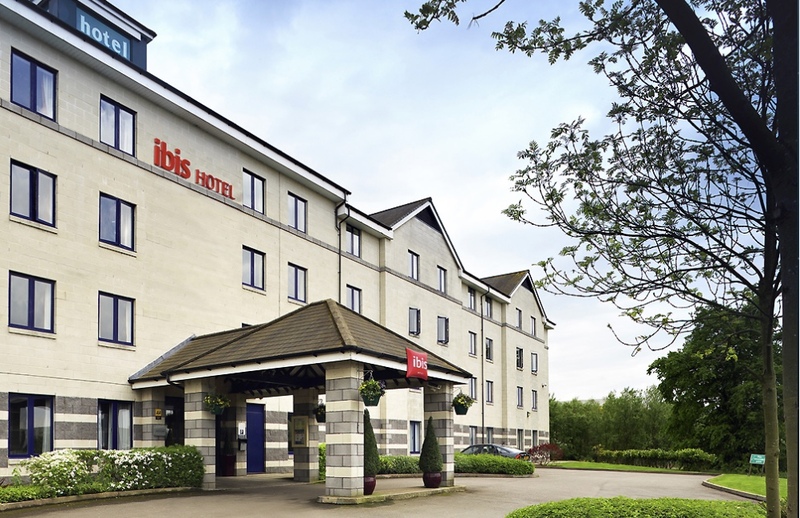 Thanks to the Ibis Hotel at Crick. They provided the rooms, the service, and the attention to our needs, and made it a pleasure to deal with them. All their staff are willing to put themselves out; making meals for one with special requirements, additional towels on request, a toothbrush, and coping with constant changing numbers of guests for our sit down dinner, our messy attendees, and happily disposing of large quantity of recyclables. Thanks to DecoArt and JoSonja for sponsoring the paints. Members can read the full, inside story in the newsletter – out soon!